You’ve watched in awe as artists dazzle on hardware like Ableton Push, Maschine, and the MPC. But maybe your fingers just haven’t been as nimble, haven’t been as quick. Now, that might change. 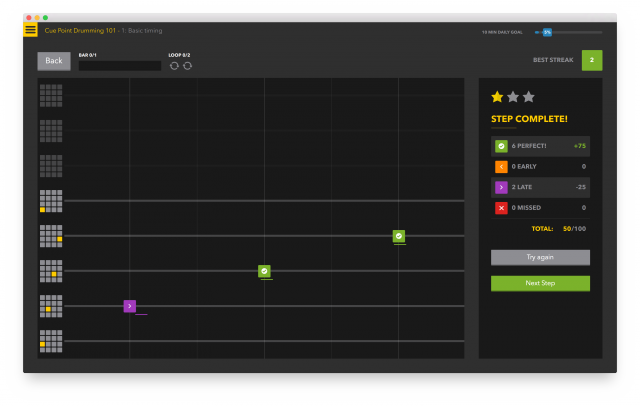 In a love child of Guitar Hero and a drum lesson, Melodics is here to save your pad-drumming chops. Traditional instrumentalists have long had plenty of ways of developing their skills, whether it be on a piano, a drum kit, or a contrabassoon. But pad drummers have been more or less on their own. 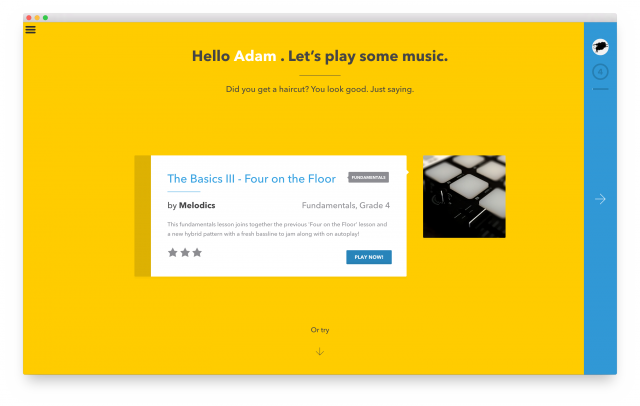 Melodics’ solution is to combine detailed, musically-specific lessons with real-time on-screen feedback – after all, your pad controller is most likely already connected to a computer. Download a desktop app (Mac available now, Windows promised soon), and you can learn routines and get rated on your accuracy as your practice. Some lessons cover basics – the paradiddles of the finger-drumming set, if you will. So you might start learning simple, reusable patterns. Others cover full songs, layer by layer. Artists range from The Gaslamp Killer to Jeremy Ellis to DJ Jazzy Jeff (suggesting turntablism may figure into this in the future). One note – any reason that all the artists so far are men? I have to apologize a bit for the Guitar Hero metaphor – maybe, really, this is what Guitar Hero should have been. The problem with the arcade game format was that it was disconnected from the musical experience. The drum and keyboard inputs came closer, but the guitar was more a parody of the actual instrument. And all of those conventional instruments have their own pedagogy, developed over centuries and taught worldwide by wildly competent human beings. Not so with finger drumming. Grid controllers don’t really look like other instruments. The artists backing Melodics have really invented their own techniques – even the question of what to play on the grid isn’t entirely obvious, since it can theoretically trigger anything from samples to melodies to drums. And on the grid, virtuosity is arguably even more important than it might be on an instrument. Unlike an instrument, you also can’t easily join an ensemble right away to motivate those chops; it’s really you versus the machine. 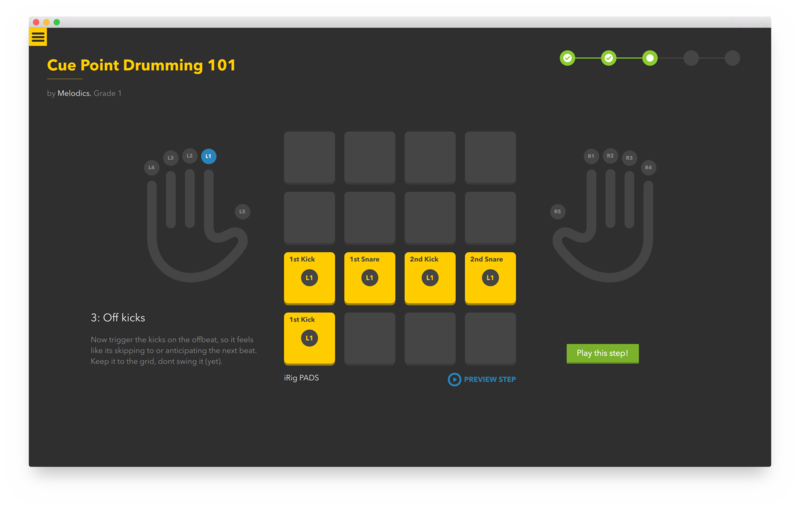 Having an app running on the machine might begin to shift that – and build armies of talented finger drummers who are then braver about jamming together. That’s more appealing than just imagining these grids will only be triggering quantized loops for the rest of time. The idea was enough to motivate former Serato CEO Sam Gribben to get behind the new startup, too. We’re in touch with Sam, so if you’re curious about what they’re doing here, and have questions – or challenges – for the upstart endeavor, let us know. In the meantime, if you’ve got a Mac and just about anything with pads on it, give Melodics a try and let us know what you think.